Just as I delighted for a moment in the ordinary but incredible scenery illuminated by the sun’s rising, I turned back to the verse where I had left off in Sirach 42: “The clear vault of the sky shines forth like heaven itself, a vision of glory. The orb of the sun, resplendent at its rising: what a wonderful work of the Most High!” The simultaneous delight of God’s Word, wisdom and beauty, with the splendor of the permeating sun just emerging on the horizon, immediately stirred a profound, gentle recognition of how my dad would understand; how he now understands, more than ever. It was a November day when he entered eternal life. I had been with my parents on his last day at home, drinking in the simplicity of precious moments woven in through this time of Paschal Mystery so penetratingly present. I was reminded very deeply of the suffering in Jesus’ Holy Face. In recent months he had not been able to stroll in their back yard, where evidence of his green thumb abounded. But as best as we could, we would enjoy the scene from the sunroom windows. 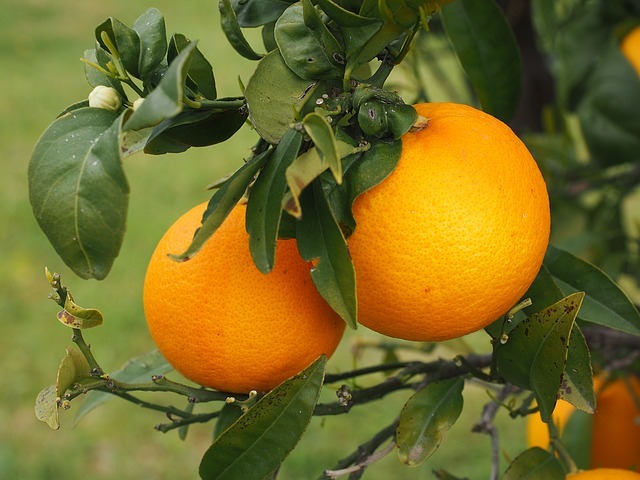 It had been in recent years that the orange trees were producing fruit that seemed to improve annually. So I said to her, “I want to check and see if there are any oranges I can bring home.” She agreed, and the next thing, we were examining the trees and the surrounding ground for any edible oranges. (I knew there would be few, if any, since one of the neighbors had recently been invited by my mom to pick some). Our search yielded two; those two pieces of fruit may as well have been gold. They represented a gift from heaven, as the inspiration to get them had seemed a meaningful gesture on my dad’s part to bestow a loving sign of his ongoing love and presence. It had been his way whenever I left from a visit, to give some small, quiet token of care that would always speak volumes. As precious to me as that was, maybe more so – was the sense that walking back toward the house with my sister brought the same feeling as before, with him right there, peacefully and contentedly being present to the present, in one of his favorite settings. I found myself appreciating this very special incident over the coming days, and the thought occurring to me (not seriously! ): “Is there any way to preserve and keep these oranges?” I knew they were meant to be eaten, and would be. I wanted to cherish the loving gift that they were. Well, a couple of days later, I came down with what seemed to be a cold, laryngitis and flu, all in one. One afternoon shortly after that, it dawned on me that those oranges would be a perfect thing to have. It was honestly one of the best oranges that I have ever eaten. I knew that the other was waiting to be enjoyed, as well, and I wanted there to be a special reason. It was hard to picture its disappearance. But then, soon after, the idea came: I would share the last one! I had invited a friend over for lunch, and it would be the perfect end to a nourishing meal on a cold, December day. Sharing it brought such joy; I was exultant to make available such a treat dear to me! (And the friend was a fellow Carmelite). I couldn’t help but notice later a reminder of the Name, “Child Jesus and the Holy Face.” The Wellspring of God’s love flows in the recognition of being personally loved and nourished by our Father, Who knows us so fully (the first orange); with that comes the rushing current of love being poured out to each other, appearing as sacrifice, but really, greatest joy in the heart (second orange). When shared, this fountain of love becomes a delight in God’s “work,” his Goodness – His LOVE.